I’ve been a huge fan of the Mountain Goats for going on ten years now. It’s hard for me to articulate exactly why they became my favorite band because it feels so emotional and personal, but it is in large part due to John Darnielle’s incredible lyrics and his ability to tell powerful stories in just a few minutes. I’ve had his books on my TBR list for awhile, but I didn’t feel very compelled to read them. I’m not usually (or ever) a fan of literary fiction, so as much as I love his music I wasn’t incredibly interested in his books. 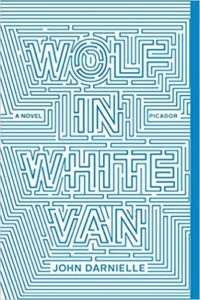 I finally picked up Wolf in White Van because I saw it on display at a library. The story is about Sean, a young man with some sort of physical disfigurement caused by an incident that isn’t described until the last chapter. He runs a text-based role-playing game through the mail. The game, Trace Italian, takes place in a post-apocalyptic U.S. When the book starts, two Trace Italian players have tried to reenact a scene from the game in real life, with disastrous consequences. As Sean grapples with the fallout, he begins to think back on his life. The story moves in reverse, with the first chapter happening in the present and the last chapter, where we discover what happened to Sean that changed his life. I read a review online that said the book was actually more enjoyable if you read it backward–starting with the last chapter and ending with the first. I could see this, as the first chapter is easily the happiest in the book. By the time you get to the last chapter, you have a pretty good idea of what happened to Sean, but it’s still honestly terrifying to read. The last chapter of Wolf in White Van has the same kind of horrifying, inevitable feel to it as the scene in Dark Places by Gillian Flynn where you find out how the main character’s entire family was murdered. I’m not sure whether I liked or disliked this book. John Darnielle is an incredible writer, and his ability to convey complex emotion in just a few words is one of the things I love best about his music. That talent is on full display here. On the other hand, I struggle with any book that is this depressing. I put it down for about a week because I just couldn’t take the unrelenting darkness. At the same time, I feel like the last scene would have packed even more of a punch if Darnielle had expanded a bit more–this is a pretty short book at just over 200 pages, and it’s a complicated story he’s telling. I think this is maybe my third review where I conclude that I just need to stop reading literary fiction. I thought this one might be different because of my love for the author, but if John Darnielle can’t write a work of literary fiction that I enjoy, I’m not sure anyone can. He came close, but I’ll still probably skip his other books. Share the post "The Scene Ends Badly, as You Might Imagine"
I feel you on the intentionally dark stuff, even if I sing “no children” to myself in the shower. For some reason I love dark, morbid stuff in music, but I hate it in literature. Same! It’s 50/50 on movies for me, but I really don’t like bleak literature. Must be the length of time you spend in that world? Couple minutes for a song, couple hours for a movie, but sometimes days with a book. At least that’s my knee jerk explanation? This sounds exactly right to me! I feel the same way.